Anthem 5k race report/review | Runner. Writer. Renegade. New racing kits for Team NB Lou! Ah, the Anthem 5k — the annual rust-busting 5k for Louisville’s competitive runners and the first-ever 5k for thousands of others. This year, the race attrached some 5,458 runners and walkers despite the city getting a foot of snow a few days before and with cold temperatures in the mid-20s at race time. Anthem is the first leg of the Louisville Triple Crown of Running, started in 1984 with a few changes in races along the way. Now it is a 5k, 10k and 10 miler spaced out every-other-weekend starting in March, and wrapping up a few weeks before the Kentucky Derby Festival miniMarathon and Marathon. I haven’t run the Anthem 5k since 2012, and the course has changed twice since then. Last year they moved it out of downtown Louisville with disastorous results (a delayed start because of traffic congestion and then an hour-long wait to leave), but brought it back to its rightful home this year. But, bridge construction downtown caused organizers to modify the course from the most recent downtown version. I actually think this year’s course is more reminiscent of the course I ran during my first Triple Crown in 2007, and I really like this version. I hope it sticks even once the construction wraps up. It includes two long straightaways and 7 turns, lots of open space to spread out that many runners. The big pre-race concern this year was the snowfall on Thursday. While the city was mostly shoveled out on Friday, the roads were still pretty messy. A big shoutout to the workers and volunteers who spent time Friday evening getting the course up to par. I was very impressed with how clear the roads were — probably the most runnable 3-mile stretch in the city. My one complaint was that the seeded start wasn’t enforced. Usually they have some barricades so that only runners bib numbers up to 200 can get in the front few rows behind the start. No barriers this year, so I was lined up four rows in behind a girl with bib 6,000-something who definitely didn’t need to be there. Sidebar: It’s not that faster runners think they’re better. It is more efficient for everyone if you’re all lined up by your anticipated pace. And, it helps your race. You don’t go out too fast, you don’t get trampled, you don’t have to weave. Once the race started, though, the first half mile was a wide straight where people could get sorted out. Let me add here that my fastest 5k last year was a 19:22, which I ran in both May and August. However, I set big PRs in the 10k and half-marathon (July and November, respectively), and both of those were spot-on with a 19:03 on the McMillan Calculator. So with three weeks of less-than-perfect training thanks to a combined total of 20” of snow and multiple days of rain, sleet and sub-zero temperatures, low-19s seemed like a big jump to make. My PR of 19:05 was set in 2008, and those two 19:22s are the closest I’ve been since then. When I set my plan up for the week (example here; it’s an Evernote notebook), I modified my goal to 19:10. That’s 6:10 pace, which is the pace at which I’ve been doing speedwork for the past 10 weeks. Minus the workout that I totally bombed last week, which wasn’t helping the confidence factor. But I was never on pace. Usually, I plan to run the first mile at goal pace then start picking it up if I can. Most 5ks I start the race at my average pace from my most recent 5k, then try to improve from there. I also like to negative split 5ks, which is hard to do but always feels so much better. I went out fast, although not out of control. (Note, these are splits per my watch, which did line up with the mile markers as much as I can remember, even though I had the race long at 3.16 — and so did everyone else.) I split 6:03 for the first mile — fast but not out of control — and I felt great. I felt like I was in a good grove, and I felt like the physical therapy I’ve been doing to engage my glutes and open my hip extension to the back was working. So I split 5:58 for mile 2. We had a nice tailwind through 1.5-2 or so. Mile 3 we picked up the headwind and I faltered coming down the long, long straightaway of Main Street, splitting 6:07. I clocked 58 seconds for the final .16, except I accidentally started my watch again after the finish. My watch tells me I set a “New Personal Record!” (if you have a Forerunner 10 or 15, you get me) of 18:44, but my official time was 19:01. Dangit. So close. There was also a girl 4 seconds ahead of me that I just couldn’t catch. Obviously time to work in some striders so I have a little more pop. In the end, though, I finished 10th female out of 3,203 and 89th overall out of 5,458. And I won my age group. A big thanks to race director Scott Wilcoxson for quickly following up on an erroneous result in the women’s top 10 and getting it corrected. 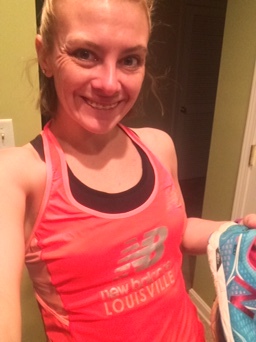 Even more exciting is that we are running New Balance Louisville teams in the series for the first time this year. Preliminary results show our women’s team picked up the division win and our men were second — a great way to hit the scene! One of the best things about the Anthem 5k — and the entire Triple Crown — is the reunion atmosphere. That who’s-who draw means you cross the finish line surrounded by other runners you know, but that you may not have seen since the fall racing season ended. There’s lots of high fives, jesting and goodwill. 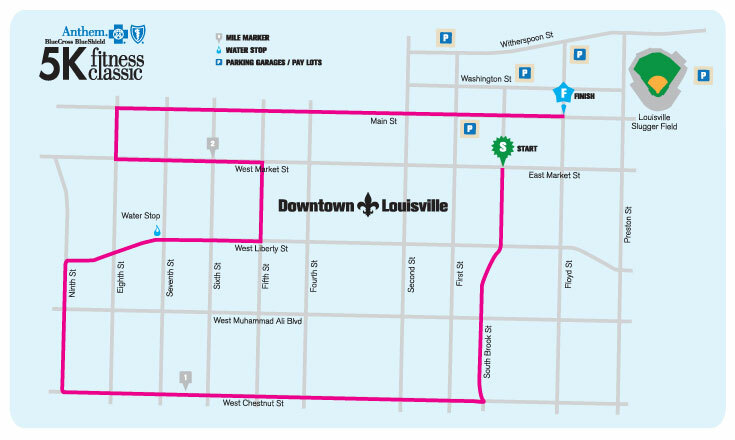 The Louisville Triple Crown is a staple in our local running community — the original series configuration launched in 1984. A couple of races and distances have changed over the year, but it is still a huge draw for runners and walkers in the city. I’m looking forward to the Rodes City Run 10k on March 21!